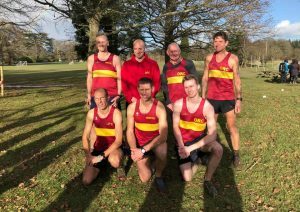 With weather that belonged more to the end of May than late February, Okehampton runners made the most of the fine conditions to get out and race last weekend. Saturday saw five ORCs take part in the Looe 10 Miler, a hilly run around West Looe and the coastal road to Talland which is part of the Cornish Grand Prix series. First home for the club was Andrew Vernon coming second in his age category with a time of 1.13.32. Katy Speak was the club’s first lady home, finishing in 1.56.51, followed by Lotte Smith in 1.57.22, with Carole Cornwall just three seconds behind in 1.57.25 and Kathryn Volkelt-Igoe in 1.58.25. Sunday was an even more glorious day for those taking part in the tough Hameldown Races, the Hameldown 7even and the “long half marathon”, the Hameldown Hammer. In the last two years this has been held in gale force wind and rain, or with ice on the ground and sub-zero temperatures, but this year saw perfect conditions for the twelve ORCs taking on the Hammer and the one running the 7even. The races start and finish in the village of Widecombe-In-The-Moor, at the foot of the Hameldown ridge and the Hammer, with a total ascent of over 600m, is a challenging test of endurance over grassy, rocky and sometimes muddy trails, with stunning views on such a good day. The shorter race is still a tough one with a double ascent of the Hameldown Ridge. First home for the club was Katie Littlejohns, whose impressive time of 1.58.25 secured her fourth lady position. She was followed home by Mike Baker, the first of the ORC men, in 2.15.04, while Jo Turner and Emma Dean ran together, finishing strongly in 2.26.08 to be first and second in the FV40 Category. Other ORC times; Molly Marvin; 2.24.18, Lucy Marrison; 2.34.57, Mags Jarvis; 2.45.38 (1st FV60), Jane Jackson; 2.46.13, Phil Turner; 2.51.33, Janet White; 3.08.31, Alison Holiday; 3.08.31, Rob Cunnington; 3.12.41. In the shorter, but still tough Hameldown 7even Angus Farrelly was the sole club representative, finishing in 1.20.53. 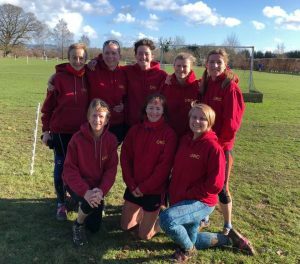 In a completely different setting, nine Okehampton runners were taking part in the Exeter 10k Charity Fun Run over a fast flat course, typical of the Exeter races through the Riverside Valley Park. Here a cool and misty start burned off during the race to give the runners brilliant sunshine for the finish. It proved to be a very successful day for the club with two coming home with trophies and a fistful of new PB’s and club records. 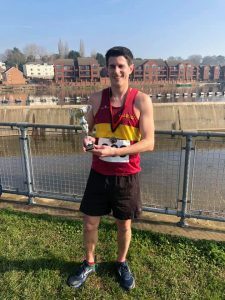 First home for the club, was Robert Kelly who had a superb race finishing third overall in a time 35.38 to set a new PB and a new Senior and overall club record for 10k. Next in was Stephen Sincock with another excellent run to come home in 38.45, a new MV55 club record and a platinum level club award. 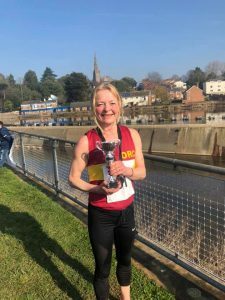 Graham Bryant was next in 39.19, followed by the club’s first lady, Claudine Benstead, with an incredible run to be third lady overall in a time of 41.30 to set a very high benchmark for the club’s FV55 record. Sarah Marvin was sixth lady, setting a new PB and new club FV45 record with her time of 43.51, with Jo Bradford finishing in 46.03 also for a new PB. Paul Evison was in form, improving on his recent 10k PB and club MV65 record by completing in 48.10, earning him his first diamond level award. Mike Westland was happy with his time of 49.10 with Kate Wilson finishing in 53.39. A single Okehampton runner travelled Egham in Surrey to take part in the Thorpe and Egham Half Marathon on Sunday. This is a relatively new race with a fast, flat course along the rural roads of Surrey. The prospect of a very large medal lured Rachael Haydon to take part here but having been out of action with a cold recently did not aim for a particular time so was thrilled to finish in 2.07.48 to knock five minutes off her PB. Thanks Jane Jackson for pulling it all together. On a cold Thursday evening in February 2009, the first meeting of the newly formed Okehampton Running Club took place and the club celebrated its 10th anniversary on the 12th February, when members old and new gathered for a social run and celebrations after at the Pavillion. The Idea of forming this club originally came from Andy Vallance, seeing an opportunity to set up a club in an area that wasn’t covered by established clubs. Introduced to Gavin Punchard at a race they discussed the idea and both runners became members of Tavistock AC in order to get an insight into how a running club operated. Friends Roger Voaden, Bryan Friend were also encouraged to join and eventually the four of them, along with Eric Johnson who had been involved in the early days of Tavistock AAC, took the plunge and started the ball rolling to get the club set up, with the help and some financial support from OCRA. After taking their coaching courses the date was set for the inaugural meeting of the club and flyers went out to sports shops, gyms and anywhere else suitable. While hoping for a good response to the advertising, they were slightly shocked on that cold, grey evening when 50 people turned up. Initially the club just met on a Thursday for a structured training session, with speed intervals or hill repetitions, but as demand grew a second training night was introduced on Tuesdays. The membership soon grew and by August there were about 65 members running regularly with the club, some being competitive runners, some just social runners, all divided into three groups to cater for different abilities. These original three groups, Coe, Holmes and Fosters still remain, but increased numbers mean that there are now five groups. 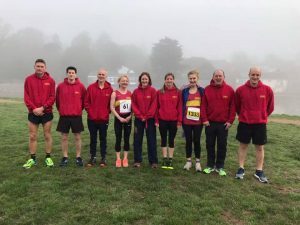 Soon Okehampton runners began to make an impact on the race scene and the following year the club took over the hosting of four small fell races to form a Summer Series, utilising the club’s location on the edge of the moors for these traditional low-key races. In 2011 the club held its first beginners group, now known by the name Couch to 5k, for people who have never run before. Starting from the very basic sessions of walk/run intervals they progress through a ten week course to being able to complete a 5k run by the end. The club had always had runners taking on the iconic London Marathon, but in 2012 it enjoyed huge success there with a record entry of 20 ORCs. Club Chairman Andy Vallance had a superb race, good enough to qualify him for an elite start at the following year’s marathon, while six others secured Good For Age qualifying times. The club continued to go from strength to strength, gaining more members and having more race successes. There were however some sadder moments in its history. In spring 2013 Andy Vallance suffered a stroke due to an undiagnosed heart defect. Shocked members all expressed their support and sympathy when the club photo at the Bideford Half Marathon showed them holding placards that spelt “Get well soon Andy”. Thankfully he made a good recovery, but at the time he should have been lining up on the elite start of the London Marathon he was learning how to walk again. Sadder still was the sudden loss of Marilyn Cooper in March 2016, a member from day one, the club’s press officer and a great supporter of all the club stood for. She is still missed today by those who knew her, but her name has been given to one of the club’s races, now known as Marliyn’s Meldon Madness. 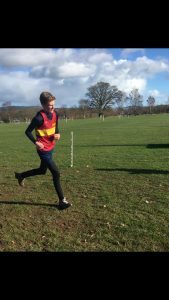 With a stronger membership of fast runners, the club fielded teams at the Westward League X-Country races in 2016 and the interest in these highly competitive, but tough races has grown with Okehampton punching above its weight against bigger clubs and University teams. In 2018 the starting up of a junior section of the club was a milestone that had originally been aimed for when the idea of the club was first conceived. Rob Hicks was the driving force behind this venture and now coaches the juniors on Thursday evenings. 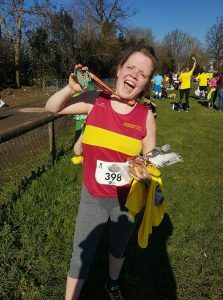 As the club has grown so has its well deserved reputation of being a very friendly, inclusive club, with members supporting runners of all abilities in their individual goals. It has become much more than just a group of runners training together, it has changed peoples lives, friendships have been forged that would otherwise never have happened and the support for fellow ORCs extends to beyond the running scene. 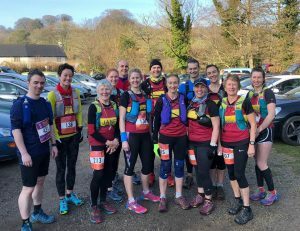 Okehampton runners are proud to wear their club colours at races in this country and abroad and represent a club that has come much further than those founding members ever envisaged. As marathon training is getting into full swing for many Okehampton Running Club members, there are fewer taking part in the shorter races. but Angus Farrelly isn’t in marathon training however and was a lone ORC at the Castle Hill Corker, organised by South Molton Strugglers. This is a multi-terrain race of just 6 miles around the Castle Hill Estate, with some steep hills and a disused railway tunnel to run through, finishing in front of the house. There was also plenty of mud but Angus enjoyed the run finishing in 1.00.53. Railways seemed to be the theme at the weekend with two ORCs taking part in the Beat The Train race. This is a 6.8 mile route along riverside paths and woodland trails from Totnes to Staverton and back to Totnes. Starting from South Devon Railways Totnes Station, the train and the runners race to Staverton Station where the train has a short stop before returning to Totnes, giving the runners a chance to pull ahead and beat the train back. Jo Page and Hayden Bond both had great runs here, and despite a mix-up at the turn around point resulting in them completing a longer distance than intended, they both beat the train back, Hayden finishing in 56.02 for 8th place and Jo in 57.19 to be 11th overall, but winning the First Lady prize. Saturday evening saw four ORCs take part in a completely new race, the Haldon Forest Twilight Run. Here there is a choice of a one lap 5k or two lap 10k course, the runners being taken along forestry tracks starting at twilight, with the darkness increasing through the race, with. Sarah and Molly Marvin chose the 10k race, but after getting lost twice they eventually completed in 58.25 after covering 7 miles. Sarah Bell and Fiona Porter did the 5k course and both enjoyed the atmosphere of trail running in the dark, a brave choice for Fiona for whom it was a first race experience, finishing together in 39.20. At the Tavy 5kool run and the Exeter Riverside Parkrun on Saturday the 5k races were all about fast times. Rob Kelly and Paul Carter ran in Tavistock, with Rob setting a new PB of 17.28 while Paul finished in 18.48, both of them now in training for the London Marathon. In Exeter Claudine Benstead continues to get faster with every run there, beating her own FV55 club record again to finish in an incredible 20.30. Thank you Jane Jackson for reporting and editing. After the snow of last week the weather last weekend was still not very runner-friendly in that there was blustery wind but that aside conditions were pretty good for the first of the two days of the Exeter Half Marathon. With the start and finish at Haven Banks on the Quay, the course is two laps of the Riverside Valley Park. With a slightly twisting route, which can be exposed to the wind in places, it is however very flat and considered a PB course. Three Okehampton runners were in action there on the Saturday, with Andy Vallance first home for the club. Now well into his training for the London Marathon Andy had a great run, finishing in time of 1.19.47. Jonathan Stephens, a relative newcomer to the club, was running his first race here and put in a great performance to finish in 1.27.11. Emma Dean hasn’t run a half marathon for two years so it wasn’t surprising she set a new PB here as her running has improved dramatically in the last year. Her time of 1.42.20 knocked a massive 18 minutes off her previous best time. Sunday saw worse conditions for Kathryn Volket-Igoe who had opted to run on this day. 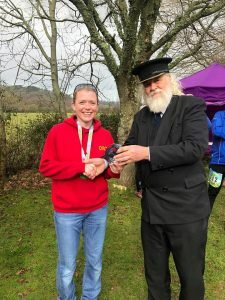 With everything from a biting cold wind, freezing rain and some occasional sunshine, Kathryn didn’t have the conditions to run a PB, but was pleased to fill in the remaining gap in her awards chart, finishing in 2.15.05. Similar conditions were experienced by the club’s Westward League runners in the penultimate meeting of the series at Stover, but with the addition of plenty of mud underfoot. The Under 13 Boy’s was the first race to have ORC represented, where Mathew Richards improved on his first run at Westward Ho! to come in 12th. The ladies found the going tough but all cheerfully ploughed their way round, with Jo Page putting in a very strong run to finish in 31st place, despite some injury worries leaving her decision to run until after a warm up round the course. Sarah Marvin finished ahead of daughter Molly here, followed by Jo Bradford who put some distance between her and Karen King this time, with Jane Jackson next, then Mags Jarvis who had overtaken Christine Fritsch in the late stages of the race. The Men’s race saw a bout of horizontal freezing hail and rain during their first lap, but some good team places were scored with Paul Crease first home in 25th place, with Andy Vallance just four places behind. 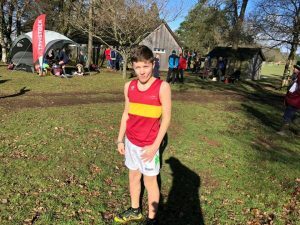 Christian Davies continues to improve his X-country times and was next home, followed by Stephen Sincock, Graham Bryant, Stuart Page and Ian Page. With just one race left the series Okehampton currently has three runners, Stephen Sincock, Ian Page and Jane Jackson holding good places in their age categories. Thank you Jane for reporting. With the untimely deluge of snow jut before the weekend there were fears that races may be affected, but as the worst of the snow was only over the moors it turned out that most races went ahead as planned. On Saturday Endurancelife’s coastal trail series started off this years series of races with the South West Coast Path Trail Running Challenge, where a selection of distances from 10k to Ultra Marathon are offered. This is where the Coastal Trail Series was born and it has become a cult classic. Situated within an Area of Outstanding Natural Beauty, it is both picturesque and punishing. There was a lone Okehampton Running Club member taking part here, club Chairman Jeremy Tandy, taking on the 34 mile Ultra Marathon, just two weeks after escorting Roger Voaden round his 100th marathon. Jeremy is no stranger to running long distances and enjoyed his run with friends round this scenic course in beautiful weather, where the only trace of snow was the occasional glimpse of Dartmoor’s white bulk in the distance, finishing in 8.30.14. 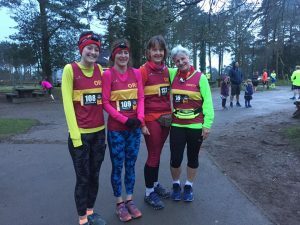 On Sunday a fast five mile race gave two Okehampton runners an opportunity to test their speed round a fast and flat course. The Exmouth Express 5 is a five mile road race comprised of a two lap course of Exmouth Town and Sea Front. Formerly known as the Fullfords Five, this race, hosted by Exmouth Harriers, is now sponsored by Climb South West. Jo Page and Jane Richardson were the two ladies representing Okehampton and both enjoyed their runs in beautiful but very cold conditions. Jo Page showed what great form she’s in with a brilliantly fast and well paced run to finish in 33min 09secs to be placed 5th lady and 1st Senior Lady, also setting a new club age group and overall record. Jane Richardson had a good run too, coming home in 48.29 to also set a new club record for the FV65 category. Unfortunately there was one ORC whose race plans fell victim to the snow this weekend. Rob Hicks was due to start the incredibly tough 100 mile Arc of Attrition along the Cornish coast path from Coverack to Porthtowan on Friday, running through the night to finish on Saturday. Obviously this sort of race requires not only a great deal of training, but also some logistical arrangements as it involves having crew to support the runners throughout the race. For someone with a family and young children this became impossible in the chaos of Thursday and Friday’s travel disruption due to the snow and sadly Rob had to abandon his race plans. Thank you Janes for the reporting. Error: Error validating access token: Session has expired on Saturday, 20-Apr-19 03:20:42 PDT. The current time is Monday, 22-Apr-19 10:56:32 PDT.